exists to edit and publish manuscripts relating to the history of the British Army. primary historical sources are made available to a wider audience. We welcome proposals for new volumes. research projects. We would suggest the National Archives website as a starting point. For only £25 a year, individual members receive a free copy of the current and all future volumes published by the Society. Members can also purchase volumes from our back catalogue at reduced rates. Every year you will be invited to attend the Annual General Meeting at which the latest editor will speak about their volume. The more members we have, the more volumes we will be able to publish. The Military Papers of Major-General Guy Dawnay, 1914-1919 edited byAimée Fox. 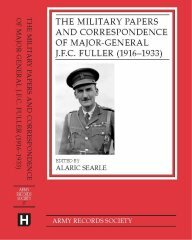 The Military Papers of Sir John Dill 1936-1941 edited by Edward Smalley. We look forward to working with Aimée and Edward and plan to publish their volumes in 2022 and 2023.